After a short but graceful struggle with cancer, Dr. Robert William Walker died on December 4th, 2018 beside his loving family. 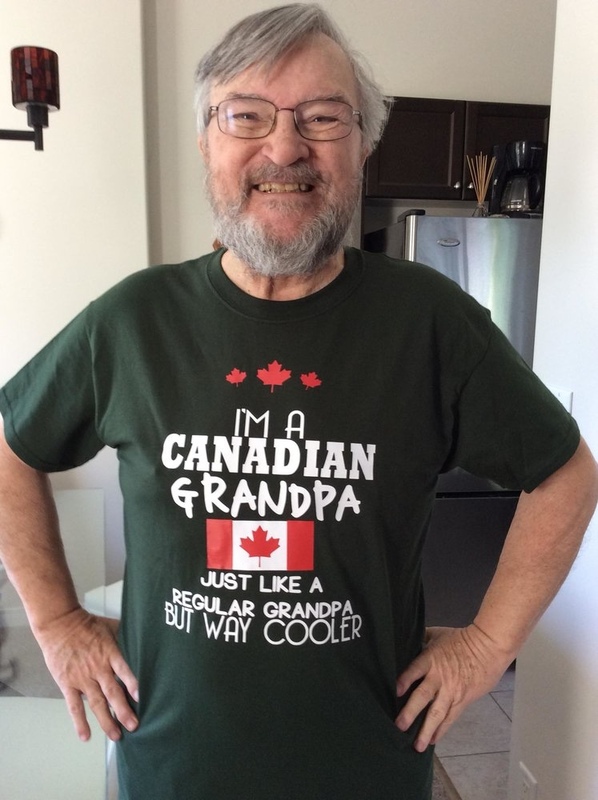 Bob was most proud of two things, his “girls” (his wife, Colleen Walker, his daughter, Kimothy Walker, and his granddaughter Kyra Lambert), and his 50 years of public service in the military and the RCMP. Bob is survived by two siblings, Patricia Bannister and Gordon Walker, and their beloved spouses Robin Bannister and Janet Walker, in addition to his niece, two nephews and a grand-nephew. Most of all he loved his wife, Colleen, his partner of 52 years. Bob started his career with the military while still in his teens and attended RRMC, RMC and eventually graduated from Queens University with an MA and Ph.D. Bob was fiercely proud of RMC, Kingston and his university. Bob was one of the kindest men who ever walked the planet and will be deeply missed by those who knew him best. A private ceremony will be held at a future date. It is with great sadness that I am advising you that Colleen Okros passed away unexpectedly last weekend from an undiagnosed illness. Colleen was the spouse of our former Branch Advisor, Capt(N) ret’d Al Okros. In addition to being a loving and steady presence to Al, she was always a great supporter of the PSel Branch. Given that many senior PSOs knew Al and Colleen, I am providing the details in terms of the service next week in case you wish to attend or provide flowers or a donation. Arrangements have been made at the Cardinal Funeral Home 366 Bathurst, Toronto (just north of Dundas) with visitation on Monday 5-8 PM and service on Tues at 1100. There will be a post-service reception at 801 Bay Street Tues afternoon. Please note that the Funeral Home is in downtown Toronto so onsite parking is limited (there are parking garages nearby and lots of taxis). In lieu of flowers, the family request donations to the Humane Society or Breast Cancer research. C’est avec grande tristesse que je vous informe de la mort de Colleen Okros, décédée de façon subite au cours de la fin de semaine dernière d’une maladie inconnue. Colleen était l’épouse de l’ancien Conseiller de notre branche, le Capv (retraité) Al Okros. En plus d’avoir été une présence aimante et constante pour Al, Colleen a toujours offert un grand appui à la Branche de sélection du personnel. Étant donné que nombre d’OSP supérieurs ont connu Al et Colleen, je vous indique le détail du service qui sera tenu la semaine prochaine, au cas où vous souhaiteriez y assister ou encore offrir des fleurs ou un don. Les arrangements ont été pris avec la maison funéraire Cardinal, 366, rue Bathurst, Toronto (juste au nord de Dundas); les visites sont prévues le lundi de 17 h à 20 h et le service aura lieu le mardi à 11 h. Le service sera suivi d’une réception au 801, rue Bay, l’après-midi du mardi. Veuillez noter que la maison funéraire se trouve en plein cœur de Toronto et que les places de stationnement sur place sont limitées; on trouve des stationnements étagés tout près et beaucoup de taxis. Plutôt que des fleurs, la famille suggère des dons à l’Association de protection des animaux ou à la recherche en cancer du sein. The latest UPSO course, held at CFTDC, was successfully completed on 22 June. I submit as a reflection from my past leading to a happy announcement in the present to convey as appropriate. My career as a PSel officer began in 1980 and lasted 15 rewarding years. I served three back to back tours in Summerside, PEI, first as an Air Nav and then as an Air Operations Controller and finally as BPSO and BTrainIng and Education O. I was then “summoned” from this fair isle to NDHQ Ottawa to assist with the conclusion of the Women’s Trials (SWINTER for short) and thereafter as ABPSO at CFB Ottawa. I was ordered back to a field posting at CFB Trenton where I experienced my most fulfilling tour as BPSO. 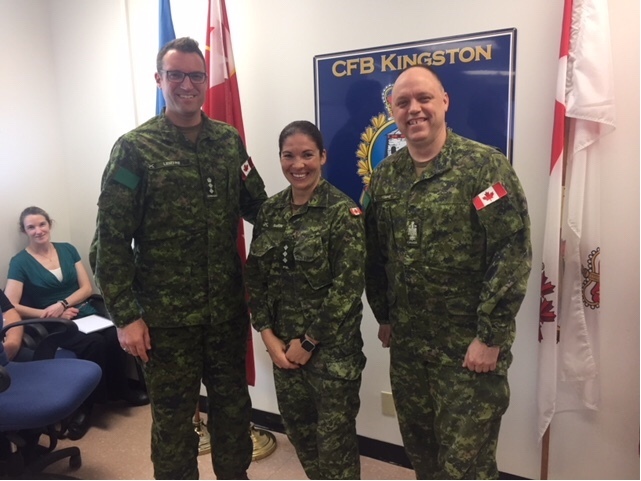 Beckoned again to Ottawa, I served as PSel consultant for social and economic analysts within DND followed by a brief team position in Military Occupational Structures. After 31 years of service, I elected a voluntary buy out. Perhaps, one of my greatest career achievements was to be recognized by my peers with the annual SCAN award. This, along with the privilege of serving with some fine dedicated professionals and comrades, has left a very positive impact on my life both then and now and for the future. I proudly stand with all my fellow PSel officers in giving thanks for the great service you provide to members of the CF. Rich, it is great to hear from you after so many years and congratulations on your upcoming 50th wedding anniversary, which is remarkable. It is because of dedicated PSOs like you that our Branch continues to exist and thrive as we are building on the foundation that you and a small number of other committed individuals built 40 years ago. You will be happy to know that last year we were awarded a permanent PSO position as the Director of Personnel Generation Requirements (DPGR) which now includes the occupation/job analysis studies that you worked on, along with oversight of the selection standards and BPSO technical net, and overall management of the CAF Strategic Intake Plan (SIP). Our F/W/BPSOs continue to be heavily relied upon for vocational counselling, education upgrading and individual assessments, while our SCAN section has now become part of a larger initiative that has recently seen the stand-up of Transition Group, headed by a BGen and where we have a LCol position, several Maj positions and a host of distributed Capt positions to better care for the transition of all members, whether voluntary, medical or at CRA. You and Maj (ret’d) Terry Christopher, amongst others, would be quite proud of all the areas in which we’re now embarking in terms of transition services, policy and programs. In any event, thanks for your note as you took me down memory lane for a wonderful minute but also it reminded me that we are still integral to all of these functions in helping the CAF remain an outstanding organization. All the best to you and your wife this summer and on your anniversary. It is with sadness that we inform you of SLt Kellermann-Thompson’s loss of his mother who passed away on the afternoon of June 13, 2018. On behalf of the PSOA we would like to send our deepest condolences to SLt Kellermann-Thompson and family. C’est avec chagrin que nous vous informons du décès de la mère du SLt Kellermann-Thompson qui nous a quitté le 13 juin 2018 en après-midi. De la part de l’AOSP nous tenions à exprimer au SLt Kellermann-Thompson et à sa famille nos sincères condoléances. Our former-PSO friend and colleague Allan Carty is retiring this month from his PSel+1 career (in the Canada Revenue Agency). The forwarded email from Denise Cressman of the CRA includes an invitation to all who knew Allan to attend a gathering to commemorate his 41 years of service to Canada. Our dear friend and colleague Allan Carty will be retiring in June. Please join us for a farewell gathering to commemorate his 41 years of service as a public servant at the Glue Pot Pub on Tuesday, June 19, 2018. We will be putting together a memory book for Allan filled with well wishes. To add a message, please visit Claire Schryer’s desk located on the 3rd floor. We will also be collecting contributions for a farewell gift. Thank you! Notre cher ami et collègue Allan Carty prendra sa retraite en juin. Afin de souligner ses 41 ans de service comme fonctionnaire, nous vous invitons à une fête de départ à la retraite qui aura lieu au Glue Pot Pub le mardi 19 juin 2018. Nous allons créer un livre de souvenirs pour Allan dans lequel vous pourrez lui souhaiter vos meilleurs vœux. Pour ajouter un message, rendez-vous au bureau de Claire Schryer au 3e étage. De plus, une collecte sera organisée afin de lui offrir un cadeau de départ. Merci! 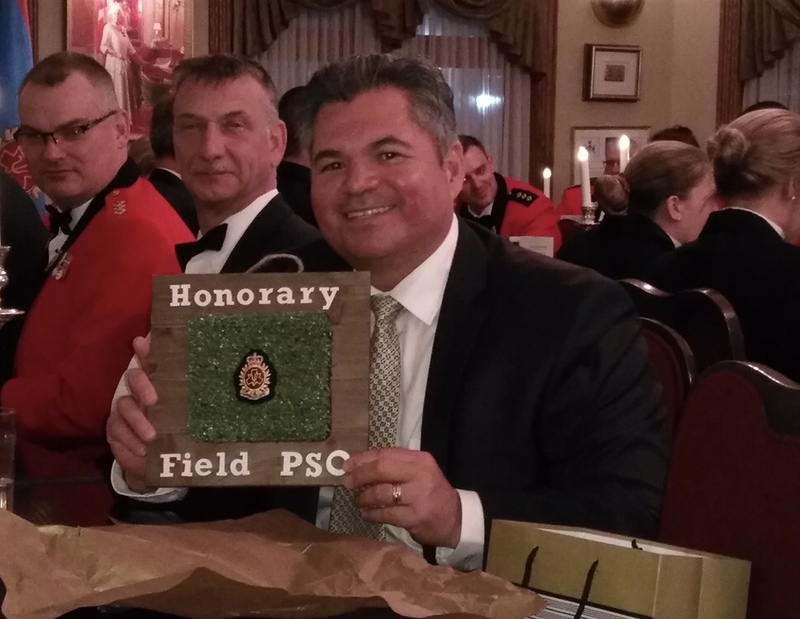 Retired Cpl Jose Montano was made an honorary field PSO at the last Mess Diner for his countless years supporting PSEL field work. Well deserved! 1. COMMANDER (CDR) FRASER BOYES WILL BE RETIRING FROM THE CANADIAN ARMED FORCES ON 9 APRIL, 2018, AFTER OVER 30 YEARS OF LOYAL AND DEDICATED SERVICE. 2. CDR BOYES IS FROM WINNIPEG, MANITOBA AND INITIALLY JOINED THE PRIMARY RESERVE FOR THE SUMMER OF 1986 AS AN INFANTRYMAN WITH THE GOVERNOR GENERAL S FOOT GUARDS IN OTTAWA. UPON RETURN TO WINNIPEG AT THE END OF THE SUMMER, AND LURED BY THE PROMISE THAT PRACTICAL TRAINING DURING THE WINTER WOULD TAKE PLACE IN VICTORIA, BC AS OPPOSED TO DUNDURN, SK OR SHILO, MB, HE COMMENCED THE PROCESS TO JOIN THE NAVAL RESERVE AS A MARS OFFICER, ENROLLING IN DECEMBER 1987. AFTER COMPLETION OF HIS MARS TRAINING, HE SERVED IN VARIOUS MINOR WAR VESSELS PRIOR TO MOVING ONTO FULL TIME EMPLOYMENT AS A MILITARY CAREER COUNSELLOR AT CANADIAN FORCES RECRUITING CENTRE (CFRC) WINNIPEG IN DEC 1993 WHERE HE REMAINED UNTIL HIS COMPONENT TRANSFER TO THE REGULAR FORCE AS A PERSONNEL SELECTION OFFICER (PSO) IN MAY 1997. POSTINGS HAVE INCLUDED EMPLOYMENT AS THE UNIT PERSONNEL SELECTION OFFICER AT CFRC S WINNIPEG AND HALIFAX, WING PSO AND COORDINATOR OF THE DISPUTE RESOLUTION CENTRE AT 17 WING WINNIPEG, BASE PSO AT CFB ESQUIMALT, AND SENIOR STAFF POSITIONS AT NATIONAL DEFENCE HEADQUARTERS IN OTTAWA AS THE NAVY COMMAND PERSONNEL SELECTION OFFICER, STAFF OFFICER WITHIN THE DIRECTOR PERSONNEL GENERATION REQUIREMENTS (DPGR), THE SECTION HEAD FOR THE IN-SERVICE SELECTION SECTION OF THE DIRECTOR MILITARY CAREER POLICY AND GRIEVANCES (DMCPG) AND THE SELECTION AND ASSESSMENT SECTION HEAD WITHIN THE DIRECTOR GENERAL MILITARY PERSONNEL RESEARCH AND ANALYSIS (DGMPRA). IN ADDITION TO THESE POSTINGS, HE WAS SELECTED FOR POST-GRADUATE TRAINING AT SAINT MARY S UNIVERSITY WHERE HE COMPLETED A MASTER OF SCIENCE IN APPLIED PSYCHOLOGY IN 2005 AND HIS GREY HAIR GAVE HIM UNRESTRICTED ACCESS TO THE FACULTY LOUNGE. A CAREER HIGHLIGHT WAS HIS DEPLOYMENT TO HAITI IN 2011 ON OP HAMLET WHERE HE WAS THE CIVIL-MILITARY COOPERATION (CIMIC) STAFF OFFICER FOR INTERNALLY DISPLACED PERSON (IDP) CAMPS AT THE UNITED NATIONS HEADQUARTERS. 3. 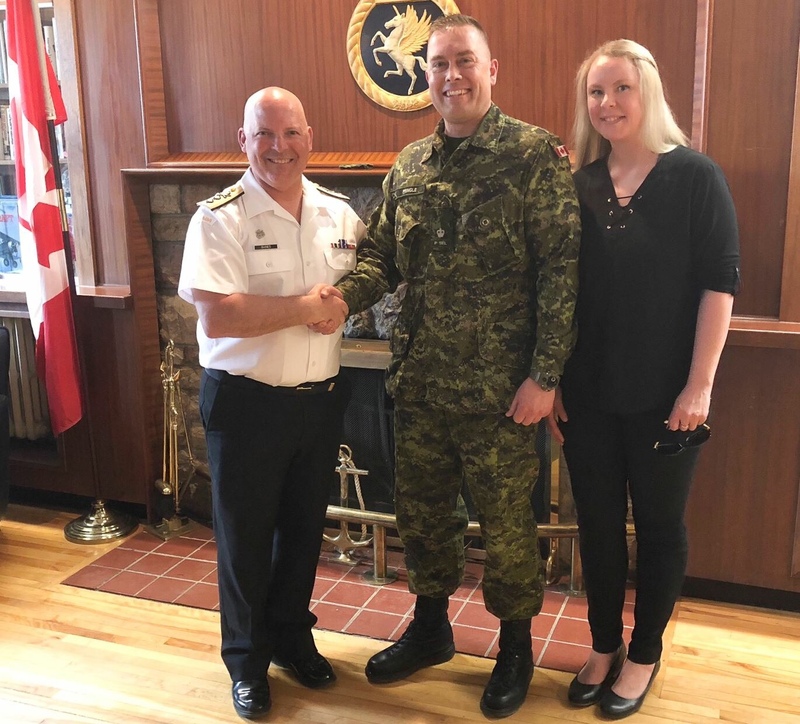 CDR BOYES IS EXTREMELY THANKFUL FOR THE REWARDING EXPERIENCES AND OPPORTUNITIES THAT SERVICE IN THE CAF AFFORDED HIM AND, MOST IMPORTANTLY, FOR THE FRIENDSHIPS HE MADE ALONG THE WAY. LIKE MANY BEFORE HIM, UNDER THE GUISE OF RETIREMENT, HE WILL REMAIN IN OTTAWA WITH HIS WIFE, LILA, AND TWO SONS, MICHAEL AND NATHANIEL, CONTINUING TO SUPPORT THE CAF AS A MEMBER OF THE PUBLIC SERVICE WITH DGMPRA. 4. ALL FRIENDS AND COLLEAGUES ARE INVITED TO JOIN CDR BOYES FOR A DEPART WITH DIGNITY CEREMONY TO BE HELD ON FRIDAY, 6 APRIL 2018 COMMENCING 1300HRS AT 3 BREWERS KANATA, 565 KANATA AVE, KANATA, ON. THOSE WISHING TO ATTEND ARE ASKED TO CONTACT MAJOR KATHARINE BERLINGUETTE NO LATER THAN 30 MARCH 2018 AT THE FOLLOWING EMAIL: MICHELLE.BERLINGUETTE@FORCES.GC.CA. 5. BEST WISHES, ANECDOTES, AND PHOTOGRAPHS ARE WELCOME AND MAY BE SENT TO MAJOR BERLINGUETTE BEFORE 16 MARCH 2018. 1. 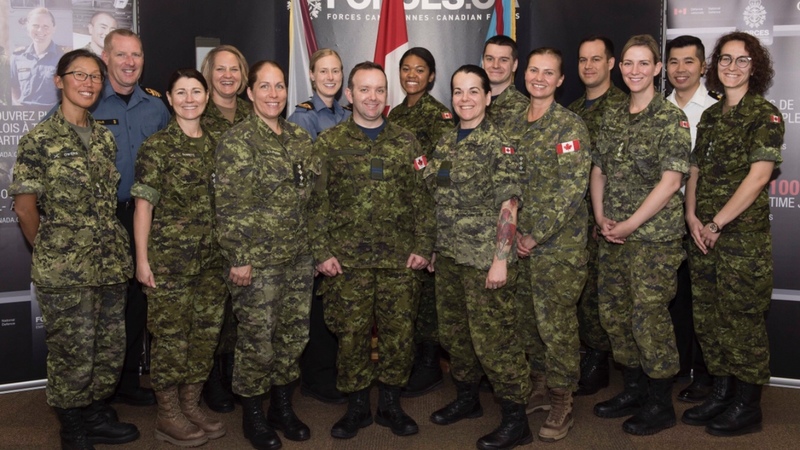 LE CAPITAINE DE FRÉGATE (CAPF) FRASER BOYES PRENDRA SA RETRAITE DES FORCES ARMÉES CANADIENNES LE 9 AVRIL 2018, APRÈS PLUS DE 30 ANS DE BONS ET LOYAUX SERVICES. 2. LE CAPF BOYES EST ORIGINAIRE DE WINNIPEG (MANITOBA) ET S’EST D’ABORD JOINT À LA PREMIÈRE RÉSERVE À L’ÉTÉ 1986 À TITRE DE FANTASSIN AU SEIN DU GOVERNOR GENERAL’S FOOT GUARDS À OTTAWA. À SON RETOUR À WINNIPEG À LA FIN DE L’ÉTÉ, ATTIRÉ PAR LA PROMESSE QUE L’INSTRUCTION PRATIQUE DURANT L’HIVER AURAIT LIEU À VICTORIA (C.-B.) AU LIEU DE DUNDURN (SASK.) OU DE SHILO (MAN. ), IL ENTREPREND LES DÉMARCHES EN VUE DE JOINDRE LA RÉSERVE NAVALE EN TANT QU’OFFICIER DES OPÉRATIONS MARITIMES ET SOUS-MARINES (MAR SS) ET S’ENRÔLE EN DÉCEMBRE 1987. 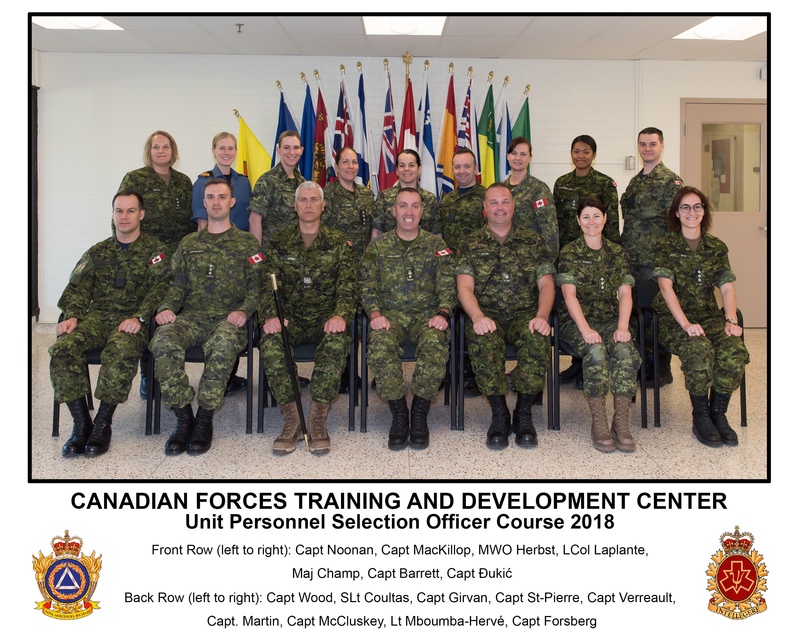 APRÈS AVOIR TERMINÉ SON INSTRUCTION MAR SS, IL SERT À BORD DE DIVERS PETITS NAVIRES DE GUERRE AVANT D’OCCUPER UN EMPLOI À TEMPS PLEIN À TITRE DE CONSEILLER EN CARRIÈRES MILITAIRES AU CENTRE DE RECRUTEMENT DES FORCES CANADIENNES (CRFC) WINNIPEG EN DÉCEMBRE 1993, OÙ IL RESTE EN POSTE JUSQU’À SON TRANSFERT DE CATÉGORIE DE SERVICE À LA FORCE RÉGULIÈRE COMME OFFICIER DE SÉLECTION DU PERSONNEL (OSP) EN MAI 1997. DANS LE CADRE DE SES DIVERSES AFFECTATIONS, IL A NOTAMMENT EXERCÉ LES FONCTIONS D’OFFICIER DE SÉLECTION DU PERSONNEL DE L’UNITÉ AUX CRFC WINNIPEG ET HALIFAX, D’OSP DE L’ESCADRE ET DE COORDONNATEUR DU CENTRE DE RÉSOLUTION DES CONFLITS À LA 17E ESCADRE WINNIPEG, AINSI QUE D’OSPB DE LA BFC ESQUIMALT, EN PLUS D’OCCUPER DES POSTES D’ÉTAT-MAJOR SUPÉRIEURS AU QUARTIER GÉNÉRAL DE LA DÉFENSE NATIONALE À OTTAWA COMME OFFICIER DE SÉLECTION DU PERSONNEL DU COMMANDEMENT DE LA MARINE, OFFICIER D’ÉTAT-MAJOR AU SEIN DE L’ORGANISATION DU DIRECTEUR – BESOINS EN PRODUCTION DE PERSONNEL (DBPP), CHEF DE SECTION DE LA SÉLECTION À L’INTERNE DE L’ORGANISATION DU DIRECTEUR – POLITIQUE ET GRIEFS (CARRIÈRES MILITAIRES) ET CHEF DE SECTION DE LA SÉLECTION ET DE L’ÉVALUATION AU SEIN DE L’ORGANISATION DU DIRECTEUR GÉNÉRAL – RECHERCHE ET ANALYSE (PERSONNEL MILITAIRE) (DGRAPM). EN PLUS DE CES AFFECTATIONS, IL A ÉTÉ CHOISI POUR EFFECTUER DES ÉTUDES SUPÉRIEURES À L’UNIVERSITÉ SAINT MARY’S, OÙ IL A TERMINÉ UNE MAÎTRISE ÈS SCIENCES EN PSYCHOLOGIE APPLIQUÉE EN 2005, ET SES CHEVEUX GRIS LUI ONT DONNÉ LIBRE ACCÈS AU SALON DU CORPS PROFESSORAL. L’UN DES FAITS SAILLANTS DE SA CARRIÈRE FUT SON DÉPLOIEMENT À HAÏTI EN 2011 DANS LE CADRE DE L’OPÉRATION HAMLET OÙ IL A AGI À TITRE D’OFFICIER D’ÉTAT-MAJOR DE COOPÉRATION CIVILO-MILITAIRE DES CAMPS POUR LES PERSONNES DÉPLACÉES À L’INTÉRIEUR DE SON PROPRE PAYS (PDIP) AU SIÈGE DE L’ORGANISATION DES NATIONS UNIES. 3. LE CAPF BOYES EST EXTRÊMEMENT RECONNAISSANT DES EXPÉRIENCES ET DES POSSIBILITÉS QUE SON SERVICE AU SEIN DES FAC LUI A OFFERTES ET, PLUS IMPORTANT ENCORE, DES AMITIÉS QU’IL A NOUÉES TOUT AU LONG DE SA CARRIÈRE. COMME DE NOMBREUX MILITAIRES AVANT LUI, SOUS LE PRÉTEXTE DE LA RETRAITE, IL DEMEURERA À OTTAWA AVEC SA FEMME, LILA, ET SES DEUX FILS, MICHAEL ET NATHANIEL, ET CONTINUERA D’APPUYER LES FAC À TITRE DE FONCTIONNAIRE AU SEIN DU DGRAPM. 4. LES AMIS ET COLLÈGUES DU CAPF BOYES SONT INVITÉS À SE JOINDRE À LUI POUR UNE CÉRÉMONIE DE DÉPART DANS LA DIGNITÉ QUI AURA LIEU LE 6 AVRIL 2018 À COMPTER DE 13 H AU RESTAURANT LES 3 BRASSEURS KANATA, 565, AV. KANATA, À KANATA (ONTARIO). CEUX ET CELLES QUI SOUHAITENT Y ASSISTER SONT PRIÉS DE COMMUNIQUER AVEC LE MAJOR KATHARINE BERLINGUETTE PAR COURRIEL AU PLUS TARD LE 30 MARS 2018 À L’ADRESSE SUIVANTE : MICHELLE.BERLINGUETTE@FORCES.GC.CA. 5. VOUS POUVEZ FAIRE PARVENIR VOS MEILLEURS VŒUX, ANECDOTES ET PHOTOGRAPHIES AU MAJOR BERLINGUETTE AVANT LE 16 MARS 2018.